Here’s something that happened to me a few weeks back that was absolutely hilarious (for me, at least). The picture is of a library book in the box we keep the library books in. One misty Friday afternoon, Shar was going to check out Scarlet and Cress for the weekend. Unbeknownst to her, a librarian was perched on a stool, watching for miscreants. At the sight of Shar’s innocent countenance, the librarian was reminded of an incident a few days prior. Shan’t had checked The Help out, and Shar had started reading it. When it was due to be returned, Shar decided to renew it in Shanti’s name (the thought of checking it out in her own name never crossed her rather vacant mind) Writing on the old fashioned yellow card with a pen and stamp, she renewed The Help. After extensive questioning, Shar admitted she wasn’t. At that precise moment, Shanti strolled into the library. “Shanti, you wanna check out this book, right?’ Shar asked casually. Shanti murmured assent. The miffed librarian looked on without comment, and let Shar go as a free woman. Back in the present, Shar was at the desk, writing her name on Scarlet and Cress’s cards. ‘Naughty’ was not the word Shar would have used to describe her supposed crime, and it’s connotations made her suppress a smile. “This is not a laughing matter! It is a very serious business! Don’t smile!” The rant (and Shar’s irrepressible smirk) continued as Shar stamped each card. “If you check out a book, and then Shanti comes in, and I ask her do you have the book, and she tells me very innocently no, then what will happen? We will never get it back and you could steal it!” The volume had risen and attracted plenty of stares from those nearby. The dean was Shar’s history teacher and she suspected he honestly would not care. After stamping her hand with one final expiry date (because she’s weird like that), Shar covered her grin with her books as the lecture closed. 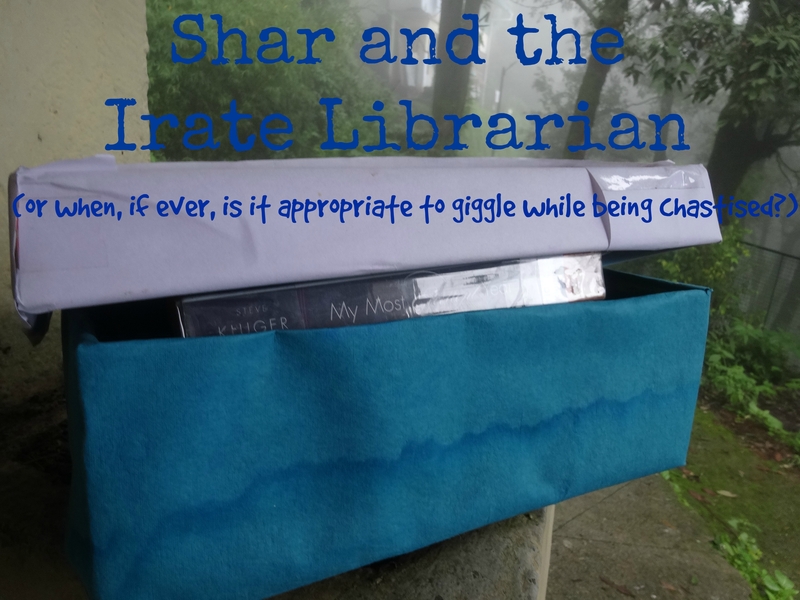 Shar heard no more as she hurried out the doors before collapsing into giggles. What are your librarians like? What do you normally do while being chastised by voices of authority (Shar normally quivers and acquiesces, but this was an exception, because reasons)? Do you have an old fashioned library? Have you read Scarlet and Cress? OMG. Naughty. Coming from a LIBRARIAN. Really, I find that the negative image of librarians is greatly exaggerated, because our school librarians are very nice. (That said, students are the ones responsible for checking out books, so that could make a difference?) I’m sorry to say, though, that HK public libraries have too few English books to be worth my while, so I can’t speak for that. But perhaps sometimes the stereotype turns out to be true, no? Yes, that day the stereotype was true. I don’t like that librarian, but the others are fine (their passion for young adult books and making people read is questionable, is all). I also just feel like the librarians at my school mainly thing their job is making people be quiet, since we study there, which is just dumb. Omg, seriously?!? A librarian called you naughty?!? OKAY THAT’S INTENSE. XD our librarians are really nice! In fact, I always turn up with 3 library cards…2 with different last names, hehe, and just borrow and pick up books for all these family members and it gets SO confusing trying to get the right books on the right cards, but I never get in trouble for it. It could aaaalso be that I usually have two preschoolers screeching behind me so everyone just tries to get me my books fast so I get out of there. 😛 Toddlers CAN be handy.